Our office and shop is conveniently located in Bear, DE. If you use a GPS device, simply use our mailing address – 611 Carson Drive, Bear, DE 19701. Several driving routes are provided below. Take I-95 (north or south, depending on your origin) towards Exit 4A / Route 7S/1S in DE. Stay on Route 1S for 3.5 miles, and take Exit 160 towards Route 40W. Porter Road will be in approximately 3.5 miles with a Rite Aid on the left and a Wawa on the right. Turn left at Porter Road and continue approximately a mile and turn left into Porter Industrial Park. BEL.com is located in the back of building 600. If travelling from southern NJ, take the Delaware Memorial Bridge to Route 13 South / Route 40 West. Once on Route 13S in New Castle, continue for approximately 3.5 miles to the Route 13/Route 40 split. Keep to the right at the split. Continue for 4.5 miles with a Rite Aid on the left and a Wawa on the right. Turn left at Porter Road and continue approximately a mile and turn left into Porter Industrial Park. BEL.com is located in the back of building 600. Take Route 896E to Route 40E and continue for approximately 3 miles. Porter Road will be in approximately 2 miles with a Rite Aid on the right and a Wawa on the left. Turn right at Porter Road and continue approximately a mile and turn left into Porter Industrial Park. 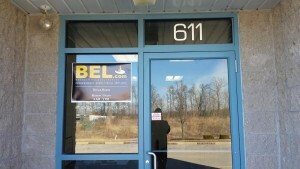 BEL.com is located in the back of building 600.